SOURCE: SP Synthetic biology is on the brink of two noteworthy accomplishments: to be able to “streamline” and redesign the genetic material of living organisms to make them operate more efficiently; and to design and assemble entirely new, artificial life forms from scratch. But a lengthy list of potential risks, as well as broad scientific and social concerns, are largely unaddressed. Download this report in .pdf format. In January 2008, scientists at the J. Craig Venter Institute announced that they had created the first complete synthetic genome, setting the stage for the complete “reprogramming” of an organism with synthetic DNA. While the ramifications of this accomplishment are stunning, the news itself was not a surprise to those who have followed the progress of biotechnology research. As evidenced by the Venter Institute announcement, synthetic biology seems to be on the brink of two noteworthy accomplishments: to be able to “streamline” and redesign the genetic material of living organisms to make them operate more efficiently; and to design and assemble entirely new, artificial life forms from scratch. According to the tenets of synthetic biology, living organisms are made up of discrete components that perform in distinctive ways, much in the same way as the functions of transistors and other electronic components can be assembled first into circuits, and then into systems designed to accomplish specific tasks. In synthetic biology, “bioengineers” are developing an inventory of biological parts, which they sometimes refer to as “biobricks,” using chemical ingredients and equipment that are common to any modern biology lab. Like electronic components, the researchers claim, these biobricks—which include genes and chromosomes, as well as proteins that can sense and report activities within a cell—can be assembled and programmed to compel organisms to operate in specific ways, or to produce custom chemicals that can later be “harvested” from cells and sold. Both the discipline and the budding industry of synthetic biology are made possible by two concurrent technological trends. One trend is the increased power, sophistication and availability of technologies for sequencing genomes and for synthesizing and assembling DNA molecules into long strings of functional genes and genomes. The second trend is the rapidly decreasing cost of these powerful technologies. The productivity of sequencing technologies has increased 500-fold over the past 10 years, and is doubling every 24 months. At the same time, costs have declined from $1 to less than $.001 for each base pair sequenced. Similarly, the productivity of DNA synthesis technologies has increased by a factor of 700 over 20 years, doubling every 12 months. The accuracy of the synthesis process has increased as well, while costs have dropped from $30 per base pair to less than $1 over the same period. These advances in automated processes and improved chemistry have made it possible to make large quantities of a wide range of moderate-length DNA sequences. The process is now so easy to do that many suppliers accept orders for custom DNA sequences over the Internet and deliver them by mail. These advances have catalyzed an industry of low-cost DNA suppliers around the globe. Synthetic biology represents an amalgam of scientific disciplines and sub-disciplines, public and private funding, public and private institutions, complex cross-sector collaborations and, in some cases, new approaches to intellectual property protection. Not surprisingly, most of the significant synthetic biology research and development is taking place in the United States, where most of the world’s biotechnology R&D activities are also centered. But other countries, most notably those in Europe, are also investing heavily in synthetic biology development. Proponents of this new engineering discipline claim that the ability to create, manipulate and cheaply manufacture customized or unique life forms will produce many benefits across a wide range of applications, from medicine to energy generation and environmental remediation. In the near term, their vision of the future includes designer microorganisms and other engineered life forms that can be deployed as “devices” to stimulate tissue repair and cell regeneration and sense changes in body chemistry that might be precursors to disease. They also say synthetic organisms will be able to produce new kinds of pharmaceutical compounds and plastics, as well as detect toxins, break down air and water pollutants, destroy cancer cells, and generate hydrogen and other substances for new energy technologies. But that vision does not adequately acknowledge an equally lengthy list of potential risks, as well as broad scientific and social concerns, that as yet are largely unaddressed. The most obvious risk, which has caused the most concern to date, is the ability bestowed by synthetic biology to design and manufacture biological weapons in the form of virulent pathogens, most notably microbes such as bacteria and viruses. Other risks come under the heading of “bioerror,” rather than bioterror: namely, the consequences of accidental release of engineered organisms that were not intended to come into contact with the open environment; the mutation of “harmless” man-made organisms into ones that are harmful to people and/or the environment; or the effects of alien organisms that invade and destroy native populations and become impossible to eliminate, in much the same way as non-native, “invasive” species of plants, animals and microbes do today. Many other critical questions have to do with broader, unacknowledged issues about scientific uncertainty. In 2007, a global consortium organized by the U.S. National Human Genome Research Institute, or NHGRI, published the results of a four-year study to identify and analyze the functional elements of the human genome—the “biobricks” upon which the discipline and industry of synthetic biology (and the entire biotechnology industry, for that matter) are built. To the researchers’ surprise, according to the NHGRI announcement, they found that the genome is not a “tidy collection of independent genes.” Instead, it appears to operate as a “complex, interwoven network,” where components interact and overlap with one another and with other components in ways that are not yet fully understood. The study, called the Encyclopedia of DNA Elements, or ENCODE, raises serious questions for synthetic biologists about the limitations of the “engineering” paradigm that they are applying to living systems. While there may be encyclopedic knowledge of the mechanics of electronic components and their interactions, clearly there remain far more questions than answers about the biological mechanisms that govern living organisms. In fact, in many respects scientists know less today about these mechanisms than they did even just five years ago. As the NHGRI said at the release of the ENCODE report, scientists are now challenged “to rethink some long-held views” about genetic components and what they do. Given this scarcity of knowledge, can synthetic biologists truly claim to know enough about living, reproducing biological systems to design artificial organisms—and, more important, to reliably predict their behavior and effects once they have been released? Are the parallels they draw between electronic components and biological parts accurate, or even relevant? More specifically, synthetic biologists have left unaddressed several critical mechanisms that limit their ability to predict the long-term consequences of synthetic organisms. One is the effects of horizontal gene transfer—the natural mechanism that moves genetic material between species and even kingdoms and facilitates, for example, the transmission of avian influenza to other animals, including mammals—when artificial genes make their inexorable move across species to indigenous organisms, or vice versa. Also unaddressed are issues about mutation and evolution; that is, how synthetic organisms will adapt to their environment once they are released. Likewise, synthetic biologists do not know how effective are the methods (such as sterilization of engineered organisms) that they say they will use to prevent synthetic life forms from reproducing. In fact, a 2004 National Academies study addressing the “bioconfinement” of genetically engineered organisms stated flatly that no single method could be considered effective. Under normal circumstances, these kinds of issues might best be considered as part of a scientific research agenda, and not as topics that should fall within the purview of governance and regulatory oversight. But the circumstances surrounding synthetic biology’s development are anything but normal. Rarely, if ever, has scientific discovery been so tightly coupled with proprietary commercial development, with so little time set aside for reflection and testing, so little consideration of results in the context of broader understanding, and so little independent review of research findings in anticipation of commercial release. Wimmer’s “five years” could conceivably come much sooner. For two years before the Venter Institute’s January 2008 announcement, for example, hundreds of undergraduates from around the world had spent their summer holidays making biological parts and building systems with them. In 2006 alone, 32 teams that participated in the International Genetically Engineered Machines, or iGEM, competition, hosted by the Massachusetts Institute of Technology, added 724 new biobricks to MIT’s Registry of Standard Biological Parts. In 2008, 84 teams and more than 1,000 undergraduate participants from 21 countries across Asia, Europe, Latin America, and the U.S. participated. Biotech companies and venture funds from around the world sponsor teams in the competition. The iGEM competition is only one example of the investment money and taxpayer-funded research dollars that are flooding the nascent field of synthetic biology. The potential payoff for the ability to build and sell novel living organisms is considered to be so great that venture capitalists, government agencies and multinational corporations, including BP (formerly British Petroleum), Shell, Cargill, and Dupont, are already investing in research and partnerships with startup companies to drive synthetic biology products to market as quickly as possible. In addition, several U.S. government agencies, including the Departments of Defense and Energy, the National Institutes of Health, and the National Science Foundation, have already made investments of millions of dollars in synthetic biology centers and projects, and published NSF research priorities for the 2009 fiscal year indicate synthetic biology funding may increase. A handful of science-minded foundations, most notably the Bill and Melinda Gates Foundation, are investing in synthetic biology projects. Not wanting to be left behind, the European Union is funding the development of a European strategy for synthetic biology, including “stimulation activities” for the mobilization of public and private resources to fuel the nascent industry. Researchers in Africa, Canada, India, Israel, Japan, Korea, Latin America, Slovenia, Turkey, and many other countries are said to be actively pursuing synthetic biology projects as well. Synthetic biology poses what may be the most profound challenge to government oversight of technology in human history, carrying with it significant economic, legal, security and ethical implications that extend far beyond the safety and capabilities of the technologies themselves. Yet by dint of economic imperative, as well as the sheer volume of scientific and commercial activity underway around the world, it is already functionally unstoppable. With hundreds of millions of dollars worldwide already spent or committed to synthetic biology R&D across several sectors, and what is almost certainly millions more in undisclosed venture financing and corporate partnerships, companies are driving hard to deliver products for commercial release. This drive to market, coupled with no substantive expert, stakeholder or public policy discussion regarding the balance of risk and benefit for its products, has led many observers to declare that synthetic biology is a juggernaut already beyond the reach of governance. Proponents are quick to point out that synthetic biology research and its products are not entirely unregulated. In the United States, the NIH still requires laboratories receiving NIH funds to comply with laboratory procedures as outlined in their Recombinant DNA Guidelines. A drug produced by a synthetic organism would be evaluated like any other by the Food and Drug Administration. Also, depending on the application, the Environmental Protection Agency or the U.S. Department of Agriculture would oversee the potential release of synthetic organisms into the environment. This argument, however, presumes that present regulations are appropriate for evaluating the products of synthetic biology. The critical question that has not been explored is whether synthetic biology poses unique risks that are unconsidered by present health and safety regulations (and regulatory approaches), as well as by financial regulations that govern intellectual property rights and trade. The main argument used in favor of self-regulation of synthetic biology’s processes is that they are simply the result of a more sophisticated application of the aforementioned laboratory techniques developed for working with recombinant DNA. As for the products of synthetic biology, practitioners argue that they already fall within the purview of existing regulations that govern genetically engineered organisms and the substances that these organisms may produce. But these characterizations sell short several fundamental, related differences between the two practices, and ignore the history of how genetically engineered organisms came to be as lightly regulated as they are today. These differences and regulatory history are worth reviewing before turning our attention to recommendations for improving the governance of synthetic biology’s products and processes. 1. Synthetic biology is based on the intentional design of artificial biological systems, rather than on an understanding of natural biology. Like traditional genetic engineering, synthetic biology uses recombinant DNA techniques to manipulate and construct various kinds of DNA molecules. The goal of a synthetic biology engineering project, like that of traditional genetic engineering, is to create an organism that does what its engineer has designed it to do. But as one report notes, “genetic engineering [is] a cut and paste affair,” shuttling traits from one naturally existing organism to another. “By contrast,” the report continues, “today’s synthetic biologists are armed with the biological equivalent of word processors.” That is, rather than simply being able to splice DNA “words” into or out of existing organisms, synthetic biologists are now in the early stages of learning to write and assemble from scratch the entire paragraphs of code needed to make an entire organism. Creating unprecedented life forms that can grow, reproduce, mutate, evolve and transfer their genes to other, naturally occurring organisms will yield consequences that are impossible to anticipate with today’s knowledge. The process is dramatically different from modifying the function of an existing organism using the techniques of traditional genetic engineering. While synthetic biologists use the tools of traditional genetic engineering, they aim to eliminate such random events by designing, writing, or rewriting an organism’s genetic code, then synthesizing the sequence of molecules themselves, using the aforementioned “standardized” parts and DNA synthesis equipment. They say such stripped-down, intentional design, coupled with directly synthesizing the genome themselves, will eliminate much of the expensive trial and error that typifies traditional genetic engineering. They believe that they will be able to far more quickly and cheaply fabricate new or more “efficient” life forms of their own design that predictably and precisely display the desired traits. But as mentioned earlier, there remain many unanswered questions about synthetic biology that bear only a partial resemblance to those asked about traditional genetic engineering. Among them is what effects artificial life forms may have on natural organisms, and vice versa. The larger, more important point is the presupposition by synthetic biologists that their existing understanding about DNA and the processes of heredity is sufficient to enable them to safely and predictably eliminate what they believe to be “inefficiencies” in natural organisms. As evidenced by the ENCODE study, this is not specious questioning by fearful people who do not understand the science. To wit: researchers are only now beginning to discover that the so-called junk DNA that is present in all organisms (it comprises between 80 and 90 percent of the human genome, for example) serves a critical function in organisms, even though it does not contain instructions for making proteins or other cell products. What is the meaning of “efficiency” when researchers understand only a fraction of how basic biological systems function and how organisms interact with each other and their environments? What is the long-term effect of willful action in the context of so much scientific ignorance and uncertainty? Finally, the fact that synthetic biology technology can be used to design and synthesize dangerous pathogens not found in nature also challenges existing laws regarding what are known as “select agents”—the toxins and pathogens that can pose a severe threat to human, plant or animal health that are regulated by the Centers for Disease Control and Prevention. Traditional recombinant DNA technology has raised similar or related concerns, but the de novo products that synthetic biology promises will eliminate the need for those with ill intent to gain access to known, naturally occurring agents or naturally occurring genetic material from these agents. This not only greatly expands the potential availability of select agents but also circumvents the CDC regulatory framework that presently governs their possession and use. 2. Synthetic biology’s practitioners are not, as a rule, biologists or even molecular biologists. Many are computer scientists or come from disciplines that do not study or work with whole organisms, but instead apply an even more mechanistic, reductionist perspective to living systems than do traditional genetic engineers. Synthetic biology’s design and construction of simplified biological systems are, at the very least, supposed to provide scientists with a useful way to test their understanding of the complex functional networks that mediate life processes. However, this understanding is still extremely limited, and extends only to the cell and to a few very small, very simple organisms. As a rule, synthetic biologists do not concern themselves with the relationship between the genetics of organisms and their environment; that is, with how whole organisms mutate and evolve, or how disparate species exchange genetic material in nature, outside of the laboratory. Traditional genetic engineers generally hold this reductionist perspective as well, but even if they tend to ignore the long-term evolutionary or network effects of their creations, at least they have had to learn how to make alien DNA behave properly within the genomes of natural plants and animals. Synthetic biologists, having no such restrictions, can ignore even this relatively low level of complexity. But at whose peril? If the goal is a regulatory environment that intelligently anticipates the unintended consequences of a new technology, these distinctions and relationships—between molecules, cells, organisms, and ecosystems—are critical. Biologists who study organisms and ecosystems are steeped in the complexity of biological systems, and understand the limitations of their knowledge about how organisms behave and interact in the real world. The plants, animals, and microbes they study demonstrate to them on a daily basis that the cell and its molecular components are not, in fact, wholly analogous to electronic circuitry. DNA and other components of heredity do not always behave in nature in the same way as they do under the controlled laboratory conditions of synthetic, or even traditional molecular biology. Without this understanding, synthetic biologists cannot reliably predict how their inventions will behave in the natural world. 3. If the goal for synthetic biologists is both public acceptance and credible risk assessment of their products and processes, genetic engineering should not be considered a model for best practices in the context of proper governance and regulation of biological innovations. A thorough examination of the historical record shows that politics and industrial interests, at least as much as scientific evidence, drove the regulatory process for genetically engineered products from its genesis in the White House Office of Science and Technology Policy in 1986. The same is true today of synthetic biology. OSTP’s starting assumption for biotech regulation, made at the behest of industry, was that only the products of genetic engineering, and not the radical new process (recombinant DNA) that was used to create them, should be considered in a safety evaluation. This assumption was noted as scientifically questionable by several administrators and scientists inside the FDA itself at the time the first regulation for a genetically engineered organism was being developed. Among other things, they noted, the product category was brand-new, thus literally no evidence or historical data, other than that provided by industry applicants, existed upon which to base such a statement. What’s more, they said, while various experts in molecular biology, chemistry, toxicology, and related fields were asked to provide input to the FDA regarding risk, not one risk analyst was invited to do so—despite the fact that the entire purpose of risk analysis is to scientifically assess the potential effects of taking action in the presence of uncertainty. By selectively narrowing the scope of their concerns and a priori not considering the process of genetic engineering itself as part of their risk evaluations, regulators were able to speed the products of genetic engineering to market. When confronted with the historical record on biotech regulation, proponents often say that there have been no known health or environmental effects as a result of genetically engineered organisms, so the approach was the right one. However, in the United States at least, there is no objective way of knowing whether that statement is true. Existing regulations contain no requirements for monitoring the movement of genetically engineered organisms in the field once they have been approved, or for labeling products with genetically engineered ingredients in the marketplace. There is no tracking or monitoring of the potential effects that engineered organisms may be producing in other living things. As a result, both the organisms and their effects are literally untraceable, should a health or safety issue arise. Nonetheless, synthetic biologists today are arguing that existing laws and policies are sufficient for their products in the presence of even more scientific uncertainty and less historical data than are available for transgenic organisms. It is an easy argument to make, and one that is not likely to be refuted by the regulators themselves, since both U.S. law and regulatory philosophy tends to place the burden of proof regarding risk or hazard on those who oppose a new technology. If new regulations cannot be avoided, agencies often work closely with regulated industries to develop the rules and select the methods that will inform the assessment process. As a result, safety determinations about a technological innovation are almost always based on evidence that regulators know the scientists can provide—a situation that inevitably leaves unasked many of the larger, more complex questions about potential hazards that scientists cannot easily answer. Self-regulation is already running into snags in the context of intellectual property; that is, who owns and controls the discoveries upon which the nascent industry of synthetic biology is based. Many academic scientists who are at the forefront of developing the technology publicly support the development of a synthetic biology “commons”—a legal framework for public access to common resources and goods (such as water) for a given community. In the context of synthetic biology, an intellectual property commons would ensure that standard biological parts remain freely available and unfettered by patent thickets that have been known to slow or halt academic research, stifle innovation and keep the fruits of discovery out of economic reach for those who might need them most. At the same time they are encouraging the development of this bioparts “commons,” and in seemingly contradictory fashion, many of these same academics serve on the scientific advisory boards of synthetic biology companies that are working to develop the proprietary patent portfolios that are required to attract investors. This paradox spotlights another critical issue regarding the credibility and objectivity of the evidence that scientists provide regulators regarding the risks of synthetic biology’s products and processes. Most synthetic biology researchers, even more than traditional biotechnologists, operate simultaneously in several spheres: as academic researchers receiving government funding for research and product development, as inventors seeking patentable discoveries, as company founders receiving investment capital from the private sector to finance product development based on those patents, and as members of scientific advisory boards for groups that are engaged in similar activities. How these conflicts affect synthetic biologists’ attitudes and perspectives on risk, and their impact on both the quality of research and the long-term viability of the nascent synthetic biology industry, has not been addressed in proponents’ reports or studies on the topic. The wide variety of products, activities and players involved in synthetic biology research and development can be separated into some general categories (see Appendix). Hundreds of scientists, companies and organizations worldwide are associated with these categories. Not all of them are key to emerging governance issues, but it is important to keep all of them in mind, because many of these categories include product offerings, methods, and practices that are shared with traditional biotechnology research and product development (such as DNA synthesis). As a result, a very large “industry-in-waiting,” so to speak, is poised to take advantage of advancements in synthetic biology. Without regulatory acknowledgment of the differences between traditional genetic engineering and synthetic biology products, these players will not have to change their existing practices or offerings very much to “upgrade” into the synthetic biology category. This will quietly increase the sector’s activity, the potential volume of products and, subsequently, the risks it poses. It is also important to note that some categories of research and development in synthetic biology are closely related to nanotechnology, another area of scientific innovation that has proven to be challenging for proper regulatory oversight and governance. Because of the untested nature of both the risks and the benefits of synthetic biology, and the tremendous financial impetus to bring commercial products based on the technology to market, it is important to take action as quickly as possible to improve the oversight and governance of synthetic biology. Four recommendations are given below. The goal is to get to Priority 3, the comprehensive risk assessment, as quickly as possible. Priorities 1 and 2 must be done first in order to best inform that assessment, and they, too, should be done without delay. Priority 1. Research and report the current regulatory situation for synthetic biology across agencies and sectors. Because of the “déjà vu” argument being presented by proponents, this research should include a reassessment of the viability and utility of regulations for the products of traditional genetic engineering. A detailed and comprehensive assessment of the regulatory environment for synthetic biology, both in the United States and abroad, is critical in order to provide a realistic foundation for future conversations about this technology. Because synthetic biologists are likely to use the official safety record of genetically engineered organisms as an argument for no additional regulations, it is important to reassess the shortcomings of these existing policies as well. In addition to including the process as well as the products of synthetic biology, this assessment must include the current thinking about scientific uncertainties in genomics-related disciplines, starting with the ramifications of findings such as those produced by the ENCODE study. In the context of the synthetic biology “commons” and other intellectual property issues, the assessment must also consider how synthetic biology is being considered within the World Trade Organization and in the context of its Trade-Related Aspects of Intellectual Property Rights agreement (commonly referred to as TRIPS), as well as within individual countries’ thinking and activities in the area. A tremendous amount of synthetic biology activity, much of which is intended to eventually yield commercial products, is taking place around the world. It is critical to learn which way governments around the world are leaning in terms of synthetic biology regulation. If one of their scientists or companies were to announce that it was ready to ship a commercial synthetic organism in the next 12 months, what would be the policy response, if any? Also critical to this assessment will be mapping where various agencies’ responsibilities and practices create gaps, conflicts or overlaps in regulatory coverage. For example, given our assessment that there are fundamental differences between synthetic biology and genetic engineering, under what circumstances will (and/or should) existing biosecurity regulations be applied? As a starting point, it might be helpful to use the concept of “select agents” and the recent report from the National Science Advisory Board for Biosecurity on synthetic biology. Select agents are pathogens or biological toxins that have been declared by the Department of Health and Human Services or by the USDA to have the “potential to pose a severe threat to public health and safety.” Possibly the most influential agency in the context of synthetic biology regulation, NSABB represents more than a dozen U.S. government offices and agencies, including EPA and USDA, which may be charged with regulating the products of synthetic biology. In the summary of its findings, the report noted the need for additional clarity about existing regulations, because “responsible agencies, affected scientists, and commercial providers differ in their interpretation of the laws, regulation and policies” as they affect synthetic biology. Given the global ubiquity of synthetic biology research and the possibly imminent release of synthetic biology products, policymakers need to be able to gauge the effectiveness of the existing oversight system—including the consistency of coordination (or lack thereof) across agencies sharing the oversight responsibility and the realities of field practice. It might also be useful to investigate whether non-obvious policy alternatives exist that could be deployed if agencies cannot be compelled to take proper action. Priority 2. Conduct a comprehensive critique of the synthetic biology reports that have been published so far, and assess their impact on decision makers. Virtually all the reports on synthetic biology have come from the synthetic biology community or from a proponent’s or an opponent’s point of view. These reports have serious logical flaws and omissions of fact and critical perspective, and they should be countered by a more objective source as soon as possible. Of the most concern in the context of risk and governance are the reports that uncritically support synthetic biology, as they encourage development and commercial release with little or no acknowledgment of the degree of scientific uncertainty that surrounds the endeavor. A 174-page report on synthetic biology published by Bio-Economic Research Associates in 2007 and funded by the Department of Energy (which itself has invested heavily in synthetic biology research), contained but a single, three-quarter-page discussion of the limitations of the engineering paradigm as applied to living systems. Giving such short shrift to a topic that is still under deep consideration in the broader scientific community lends an air of certainty to a highly uncertain endeavor. Such under-representation has real significance from the perspective of investment and economic risk, as well as from that of health and the environment. Similarly, and perhaps most disappointingly, a $500,000 report funded by the Alfred P. Sloan Foundation on synthetic biology’s “Options for Governance” was co-authored by two of the pioneering institutions of synthetic biology, the J. Craig Venter Institute and MIT, along with the Center for Strategic and International Studies. Promoted as a “stakeholder” study on the broader societal risks and implications of synthetic biology, the Sloan study instead focused mainly on the largely benign laboratory procedures for handling synthetic organisms in the context of biosafety. It did not substantively address the more significant issues of scientific uncertainties, intellectual property conflicts, or the social implications and the intended and unintended effects of synthetic biology’s products on human health or the natural environment. Not surprisingly, given its co-authors, the “options for governance” that were presented in the study’s conclusions weighed heavily in favor of self-regulation. Discovering the degree to which such biased perspectives and recommendations have affected decision makers will be an important step in a more relevant and comprehensive approach to assessing synthetic biology’s risks. This knowledge will also be an important factor in deciding how quickly action must be taken to counter their biases, as legal judgments or official decisions on synthetic biology become imminent. Priority 3. Using (and challenging the assumptions of) the data and scenarios in the above-mentioned reports, conduct a comprehensive risk characterization of synthetic biology. Given the financial and intellectual momentum of the nascent industry, it is not surprising that there is a tremendous aversion in the synthetic biology community to speaking directly about the risks of unintended or unanticipated consequences, or to involving risk practitioners who are schooled in methods that are designed for highly uncertain issues or experts from other sectors in assessments of its future. It is very difficult to find a synthetic biology report that uses the word risk more than in passing, let alone directly addresses the subject at any depth. One reason for this omission is that many scientists believe the word risk refers to a technical calculation of probability that is demonstrable only by way of “evidence” that a risk exists. Such calculations are near impossible, however, when analyzing technological innovations, where there are no historical precedents other than by analogy and sparse data to use in a probability calculation. Yet without data, these scientists say, there is no risk, only speculation. While technically “scientific” in its approach, this circular argument forces decision makers to consider only a very narrow, pre-determined and ultimately subjective view of the important issues they are being asked to address. However, there is another approach to risk assessment that has proven very useful for decisions regarding scientific and technological innovations. This approach combines data analysis and extensive deliberation with a broader representation of relevant scientific expertise, as well as parties who are interested in the issue or who will be affected by the outcome of the analysis. This process of analysis and deliberation is described in the 1996 National Academy of Sciences study, Understanding Risk: Informing Decisions in a Democratic Society. Should this type of assessment be undertaken, the analytic deliberative approach could be augmented with a methodology that is under development by myself and Baruch Fischhoff at Carnegie Mellon University, designed to address unprecedented risks such as those presented by synthetic biology. It uses scenario narratives to develop comprehensive risk models that are computable over time, as research continues and data become available. There are several credible scenarios available regarding synthetic biology that, taken together, could provide the foundation for characterizing and assessing synthetic biology’s risks and benefits. (e) A public database/repository to collect information on synthetic biology so that risks (and regulations) can be reassessed as new data are added and uncertainties are reduced. Priority 4. Convene cross-sector stakeholder working groups on elements in the assessment that were deemed most important to address. (a) Scientific uncertainties. How should the nature and extent of the scientific uncertainties in synthetic biology, discovered during the risk-characterization process, affect regulatory policies? Are there examples of more iterative (Bayesian) approaches to policy that can be deployed for issues such as these, where well-informed decision makers have determined there is a need to move forward with research and development despite scientific uncertainty? What is required in terms of research funding to better address these uncertainties in advance of commercial deployment? (b) Patents and intellectual property. How do existing patent and intellectual property laws add to or lessen the broad risk profile for synthetic biology products? What would happen if a significant portion of the field’s intellectual property remained in the public domain or commons, as some synthetic biologists want? What would be the social and economic implications of various patent approaches to synthetic parts and organisms? Having this conversation soon, before too many synthetic biology patents are issued, could be tremendously useful. (c) Human factors. What human factors affect the regulatory/policy profile for synthetic biology’s products and processes, and what kinds of interventions can best address them? Who are the equivalents of the nuclear plant operators in synthetic biology scenarios, i.e., what constitutes risky behavior for humans using synthetic biology in the field? This group would look at implications for deliberate misuse of the technology as well as for bioerror. If even a fraction of its proposed applications pan out over the long term, synthetic biology has the capacity to radically change our approach to some of the most pernicious problems of our time. That human beings may someday know enough to safely and predictably engineer life forms that can eliminate ocean pollution, generate sustainable energy sources, or help to eliminate infectious diseases will be nothing short of transformative. So it is no wonder, standing at what seems to be the very brink of such tremendous promise, that proponents of synthetic biology want to dismiss most conversations about risk as speculation. But it is important to note that in its early stages, the promised benefits of any technological innovation are purely speculative as well. While there may not be historical precedent for synthetic biology, the history of science is replete with examples of the high price of biological interventions that were brought to market or released without sufficient consideration of consequences. For example, the toads that were imported from Hawaii to rid Australia’s sugarcane plantations of beetles have instead eaten all the native amphibian and invertebrate species in their path—except the cane beetle. The morning-sickness drug DES, sold to millions of women between 1940 and 1971, was almost entirely ineffectual for its ostensible purpose, yet has passed along its carcinogenic mutations to children in every subsequent generation. The overuse of man-made antibiotics has created new strains of “superbugs” that are virtually unkillable and can make being admitted to a hospital more life-threatening than staying at home. And we have not yet begun to tally the costs of regulatory myopia about nanotechnology, where agencies remain loathe to step in despite the demonstrated health and environmental risks of some nanomaterials. Synthetic biology stands to have a far greater impact than all of these—especially if its products are allowed to be released without pausing for thoughtful consideration of risk and benefit in the context of scientific uncertainty. Many of synthetic biology’s proponents see such consideration as an opportunity cost, maintaining that both money and benefit are lost each day their activities are questioned or delayed. But the role of government is to understand these developments in a broader context, properly oversee them, and ensure that society is not forced to bear the cost of that opportunity, should plans go awry. Today, with the benefit of hindsight, we have developed the methods to practice foresight in these matters. We have in hand the means to practically address scientific uncertainty and risk for the benefit of all stakeholders: the industry, the independent research community, and the public. The sooner and more willingly that we as a society embrace those means, the greater the opportunity will be for synthetic biology to fulfill its promise. I am grateful to David Rejeski at the Woodrow Wilson International Center for Scholars for supporting the research and the writing of this report; and to the Center for American Progress and Rick Weiss for its final production and publication. All views expressed herein are my own, and do not necessarily reflect the positions of either organization. Denise Caruso is executive director and co-founder of the Hybrid Vigor Institute, an independent, not-for-profit research organization and consultancy that is dedicated to interdisciplinary and collaborative problem solving. She is the author of Intervention: Confronting the Real Risks of Genetic Engineering and Life on a Biotech Planet, which won a Silver Medal in the Science Category of the 2007 Independent Publisher Book Awards, and was listed as a “Best Business Book of 2007” by strategy+business magazine. She also edits and contributes to the Institute’s blog, at hybridvigor.org and, in 2008, was named a contributing editor for strategy+business, where she writes about risk, public policy, and innovation. Caruso has developed and served as co-principal investigator on research projects that aim to improve upon traditional methods of risk and decision analysis for innovations in science and technology. Topics of case studies in which she has been involved, funded by the National Science Foundation, have included the risks of xenotransplantation using genetically modified pigs, and the risks of pandemic avian influenza. She is an affiliated researcher at the Center for Risk Perception and Communication at Carnegie Mellon University. Since 2003, she has been a member of Global Business Network, a worldwide organization that works to enhance competitive and adaptive capacities in organizations through collaboration, scenario development, and strategic planning. Caruso is also a veteran journalist and analyst. In 2007, she wrote “Re:framing,” a column on innovation and creativity, for the Bright Ideas page in the Sunday Business section of The New York Times. She also chronicled the converging industries of digital technology and interactive media from the mid-1980s to 2000. For the five years prior to founding Hybrid Vigor in 2000, she wrote the Technology column for the Monday Information Industries section of The New York Times. One of the first journalists to focus on the intersection of technology, commerce, and culture, Caruso is a director emerita of the Electronic Frontier Foundation. She was elected to the board of directors of the Independent Media Institute in January 1995, and continues to serve in that capacity. She is a trustee of the Molecular Sciences Institute, a non-profit laboratory conducting research into basic biological processes. She also serves on the advisory boards of several organizations, including Public Knowledge and London-based SustainAbility.com; she recently became an advisor to Echo & Shadow, an intelligent robot company. Hundreds of scientists, companies, and organizations are already engaged in synthetic biology research and development. A comprehensive, albeit somewhat dated list, with an emphasis on research and researchers in North America and Europe, may be found in the European Union report “Synbiology: An Analysis of Synthetic Biology Research in Europe and North America,” published in October 2005. The general categories of key products, applications and players in the field of synthetic biology (listed alphabetically) are populated as follows. (Theoretical) computerized modeling, which includes computer analysis and modeling of natural systems, molecular networks, and synthetic biology systems. 1. George Church: professor of genetics, Harvard Medical School; director, Center for Computational Genetics, Harvard University; co-founder, Codon Devices; co-founder, LS9 Inc. Considered one of the pre-eminent synthetic biology researchers, Church is also a well-known figure in the larger biology community. His 1984 Ph.D. dissertation included a description of the first direct genomic sequencing. He also co-initiated the Human Genome Project while serving as a postdoctoral fellow at Biogen and as a Monsanto fellow at the University of California, San Francisco. As director of the Center for Computational Genetics, he is developing broadly distributed, integrated models for biomedical, biofuel, and ecological systems. The Center’s research currently focuses on genome engineering and synthetic biology development to build “genetic circuits,” vaccines and optimal drug biosyntheses. Among many other active and advisory affiliations, Church also co-founded Codon Devices in Cambridge, the first venture-backed synthetic biology company that is focused on synthesizing very long pieces of custom DNA, and LS9, which is designing biofuels produced by microbes created via industrial synthetic biology. The former assistant professor at the Massachusetts Institute of Technology moved to Stanford University in fall 2008 to become its first synthetic biology professor and is probably the best-known and most public face of synthetic biology. Widely acknowledged as a founder of the field, he is one of its most active participants in all aspects, from academic research to social implications and commercial development. At MIT, he co-founded the Registry of Standard Biological Parts as well as the annual iGEM international synthetic biology design competition, where teams of undergraduate students create novel biological parts and build them into working systems. He is a co-founder of Codon Devices. He also started the non-profit BioBricks Foundation, whose mission is to ensure that standard biological parts remain freely available to the public and to encourage the development of codes of standard practice for the use of standard biological parts. The Gates Foundation is helping drive synthetic biology research out of the lab and into applications by investing in health-related synthetic biology products. In addition to the $42.6 million it granted to three organizations for the development of a synthetic microbe to produce an anti-malarial compound, the Foundation has granted $19.4 million to a consortium, led by the Seattle Biomedical Research Institute’s Viral Vaccines Program, to create synthetic molecules to trigger antibodies against HIV. The Sloan Foundation is one of the few remaining private philanthropies that funds direct research in selected areas of scientific significance. In 2005, Sloan’s Bioterrorism Program awarded $500,000 to the J. Craig Venter Institute, in collaboration with the Center for Security and International Studies and the Synthetic Biology Group at MIT, to examine the risks and benefits of synthetic genomics in the context of regulations and governance. Through its Bioterrorism Program, Sloan has also made several other grants aimed at addressing issues of potentially dangerous applications of synthetic biology. These include a feasibility study to develop a global network of bioscientists, support for a workshop on Genomics for Development, Bioterrorism, and Human Security, and an assessment of the World Health Organization’s oversight of smallpox virus research. Keasling is responsible for two of the field’s largest and most visible synthetic biology projects, spanning both academic research and commercial development. He is director of the Synthetic Biology Engineering and Research Center (SynBERC) at U.C. Berkeley, funded with $16 million from the National Science Foundation and $4 million from the biotech industry and participating universities. Amyris, which he co-founded, is developing synthetic microbes capable of producing novel pharmaceuticals, renewable fuels and specialty chemicals. SynBERC and Amyris, along with OneWorld Health, were Gates Foundation grantees for the development of synthetic microbes to produce artemisinin, an anti-malarial compound. The U.S. government is a primary driver of the nascent industry of synthetic biology. Several agencies have each committed several millions in taxpayer dollars to synthetic biology researchers and organizations, most of which is directed toward specific applications. These include the NIH, including the National Cancer Institute, the National Institute for Allergy and Infectious Diseases, the National Institute of General and Medical Sciences, the National Institute of Biomedical Imaging and Bioengineering, the NIH Roadmap Program, the Nanomedicine Program, and the NIH Cancer Biology Training Grants Program. The Department of Energy is funding research and development into synthetic organisms to produce biofuels and clean up pollution, as well as explorations into societal consequences such as the relationship of synthetic biology to intellectual property law. The Department of Commerce’s Advanced Technology Program has awarded a grant for the development of synthetic microbes to convert sugars into plastic. The NSF also has committed several millions of dollars to synthetic biology research, primarily to academic institutions. Venter is still best known for his role in mapping the human genome, but his personal ambition, combined with his ability to draw worldwide media attention, has placed his organizations’ activities at the center of the synthetic biology field. He and Drew Endy are generally the scientists of record when questions about the risks of synthetic biology are raised by outsiders. Venter’s activities are also the most visible example of the fluid financial arrangements that typify synthetic biology. His privately held company, Synthetic Genomics, is developing synthetic genomes and organisms for commercial applications in renewable energy and bioremediation—based on research done under the auspices of his own non-profit research institute, the J. Craig Venter Institute. The institute, which is funded by government grants as well as by Synthetic Genomics, is focused on trying to develop a minimal cell in order to build a new cell and organism with optimized functions. Synthetic Genomics’ president is Aristides Patrinos, former director of the Office of Biological and Environmental Research for the DOE, which made significant investments in synthetic biology and, more specifically, in Venter’s projects during the period when Patrinos was at the helm. Venture capital may be more responsible for driving the creation of a synthetic biology industry than are the scientific discoveries coming from the research community. At the time Codon Devices received its first round of venture capital, for example, its co-founders and principals (named above) were basically the entire roster of synthetic biology researchers in the world. A handful of well-known venture capital firms, primarily those that have been involved in early-stage science and technology investments in Silicon Valley and in Cambridge-based startup companies, have already established a beachhead in the synthetic biology area. These firms include Alloy Ventures, Khosla Ventures, Kleiner Perkins Caufield & Byers, Mohr Davidow, and X/Seed Capital. A base pair refers to the two nucleotides that form a “rung” of the DNA ladder. The number of base pairs is used to describe the length of a DNA strand. DNA sequencing is the process of determining the exact order of the base pairs that comprise individual genes as well as whole genomes. DNA synthesis is a natural cellular process that replicates DNA, but as used here refers to artificial, chemical replication. James Newcomb, Robert Carlson, Steven Aldrich, Genome Synthesis and Design Futures: Implications for the U.S. Economy (Cambridge, MA: Bio Economic Research Associates, 2007). The ENCODE (ENCyclOpedia of DNA Elements) Project, available at http://www.genome.gov/10005107 (accessed August 18, 2008). Committee on Biological Confinement of Genetically Engineered Organisms, “Biological Confinement of Genetically Engineered Organisms” (National Research Council, 2004). Holger Breithaupt, “The engineer’s approach to biology,” EMBO Reports, 7(1)(2007): 21-24, available at http://www.pubmedcentral.nih.gov/articlerender.fcgi?artid=1369239 (accessed August 8, 2008). Elizabeth Pain, “Getting Ready for Synthetic Biology,” Science Careers, October 17, 2008, 10.1126/science.caredit.a0800152, accessed at http://sciencecareers.sciencemag.org/career_magazine/previous_issues/articles/2008_10_17/caredit.a0800152. Arti Rai and James Boyle, “Synthetic Biology: Caught Between Property Rights, the Public Domain, and the Commons,” PLoS Biology, March 13, 2007, available at: http://biology.plosjournals.org/perlserv/?request=get-document&doi=10.1371%2Fjournal.pbio.0050058&ct=1 (accessed August 8, 2008). The ETC Group, “Extreme Genetic Engineering: An Introduction to Synthetic Biology” (Ontario, Canada, 2007), available at: http://www.etcgroup.org/en/materials/publications.html?pub_id=602 (accessed August 18, 2008). National Science Advisory Board for Biosecurity, “Addressing Biosecurity Concerns Related to the Synthesis of Select Agents” (Rockville, MD: National Institutes of Health, 2006). A lengthy discussion of this issue can be found in Intervention: Confronting the Real Risks of Genetic Engineering and Life on a Biotech Planet, Chapter 6, “Politics, Science and Substantial Equivalence” (Hybrid Vigor Press, San Francisco, 2006). European Commission, “Synbiology: An Analysis of Synthetic Biology Research in Europe and North America: Output D3: Literature and Statistical Review,” European Commission FP6 Reference: 15357 (2005), pp 28-40, available at: http://www2.spi.pt/synbiology/documents/SYNBIOLOGY_Literature_And_Statistical_Review.pdf (accessed August 18, 2008). Michelle S. Garfinkel, Drew Endy, Gerald L. Epstein, Robert M. Friedman, “Synthetic Genomics: Options for Governance,” (Rockville, MD, Washington, DC, Cambridge, MA: J. Craig Venter Institute, Center for Strategic and International Studies, Massachusetts Institute of Technology, 2007), available at: Available at http://www.jcvi.org/cms/fileadmin/site/research/projects/synthetic-genomics-report/synthetic-genomics-report.pdf (accessed August 18, 2008). Paul C. Stern, Harvey V. Fineberg eds., Understanding Risk: Informing Decisions in a Democratic Society (Washington, DC: Committee on Risk Characterization, National Academy of Sciences: National Academy Press, 1996). Denise Caruso and Baruch Fischhoff, principal investigators, “Understanding Genomic Risks: An Integrated Scenario and Analytic Approach” (Washington, DC: National Science Foundation Award No. SES-0350493, 2006). Seattle Biomedical Research Institute, press release: “Sbri Receives $19.4 Million HIV/AIDS Research Grant From Gates Foundation” (Seattle, WA: 2006), available at: http://www.sbri.org/news/2006/releases_06/SBRI-Receives-$19.4M-Gates-Grant-for-HIV-Vaccine-Research.pdf (accessed August 18, 2008). In January 2008, scientists at the J. Craig Venter Institute announced that they had created the first complete synthetic genome, setting the stage for the complete “reprogramming” of an organism with synthetic DNA. While the ramifications of this accomplishment are stunning, the news itself was not a surprise to those who have followed the progress of biotechnology research. Technologies that can “read,” map, and manipulate the genetic code of living organisms have escalated in power and capabilities over the past 30 years, yielding an unprecedented amount of data and a more sophisticated understanding of how genetic materials give form and function to living cells. This new knowledge has, in turn, given rise to a new engineering discipline for living organisms—a discipline that has become known as “synthetic biology.” As evidenced by the Venter Institute announcement, synthetic biology seems to be on the brink of two noteworthy accomplishments: to be able to “streamline” and redesign the genetic material of living organisms to make them operate more efficiently; and to design and assemble entirely new, artificial life forms from scratch. According to the tenets of synthetic biology, living organisms are made up of discrete components that perform in distinctive ways, much in the same way as the functions of transistors and other electronic components can be assembled first into circuits, and then into systems designed to accomplish specific tasks. In synthetic biology, “bioengineers” are developing an inventory of biological parts, which they sometimes refer to as “biobricks,” using chemical ingredients and equipment that are common to any modern biology lab. Like electronic components, the researchers claim, these biobricks—which include genes and chromosomes, as well as proteins that can sense and report activities within a cell—can be assembled and programmed to compel organisms to operate in specific ways, or to produce custom chemicals that can later be “harvested” from cells and sold. Both the discipline and the budding industry of synthetic biology are made possible by two concurrent technological trends. One trend is the increased power, sophistication and availability of technologies for sequencing genomes and for synthesizing and assembling DNA molecules into long strings of functional genes and genomes. The second trend is the rapidly decreasing cost of these powerful technologies. The productivity of sequencing technologies has increased 500-fold over the past 10 years, and is doubling every 24 months. At the same time, costs have declined from $1 to less than $.001 for each base pair sequenced. Similarly, the productivity of DNA synthesis technologies has increased by a factor of 700 over 20 years, doubling every 12 months. The accuracy of the synthesis process has increased as well, while costs have dropped from $30 per base pair to less than $1 over the same period. These advances in automated processes and improved chemistry have made it possible to make large quantities of a wide range of moderate-length DNA sequences. The process is now so easy to do that many suppliers accept orders for custom DNA sequences over the Internet and deliver them by mail. These advances have catalyzed an industry of low-cost DNA suppliers around the globe. Synthetic biology represents an amalgam of scientific disciplines and sub-disciplines, public and private funding, public and private institutions, complex cross-sector collaborations and, in some cases, new approaches to intellectual property protection. Not surprisingly, most of the significant synthetic biology research and development is taking place in the United States, where most of the world’s biotechnology R&D activities are also centered. But other countries, most notably those in Europe, are also investing heavily in synthetic biology development. Proponents of this new engineering discipline claim that the ability to create, manipulate and cheaply manufacture customized or unique life forms will produce many benefits across a wide range of applications, from medicine to energy generation and environmental remediation. In the near term, their vision of the future includes designer microorganisms and other engineered life forms that can be deployed as “devices” to stimulate tissue repair and cell regeneration and sense changes in body chemistry that might be precursors to disease. They also say synthetic organisms will be able to produce new kinds of pharmaceutical compounds and plastics, as well as detect toxins, break down air and water pollutants, destroy cancer cells, and generate hydrogen and other substances for new energy technologies. But that vision does not adequately acknowledge an equally lengthy list of potential risks, as well as broad scientific and social concerns, that as yet are largely unaddressed. The most obvious risk, which has caused the most concern to date, is the ability bestowed by synthetic biology to design and manufacture biological weapons in the form of virulent pathogens, most notably microbes such as bacteria and viruses. Other risks come under the heading of “bioerror,” rather than bioterror: namely, the consequences of accidental release of engineered organisms that were not intended to come into contact with the open environment; the mutation of “harmless” man-made organisms into ones that are harmful to people and/or the environment; or the effects of alien organisms that invade and destroy native populations and become impossible to eliminate, in much the same way as non-native, “invasive” species of plants, animals and microbes do today. Many other critical questions have to do with broader, unacknowledged issues about scientific uncertainty. In 2007, a global consortium organized by the U.S. National Human Genome Research Institute, or NHGRI, published the results of a four-year study to identify and analyze the functional elements of the human genome—the “biobricks” upon which the discipline and industry of synthetic biology (and the entire biotechnology industry, for that matter) are built. To the researchers’ surprise, according to the NHGRI announcement, they found that the genome is not a “tidy collection of independent genes.” Instead, it appears to operate as a “complex, interwoven network,” where components interact and overlap with one another and with other components in ways that are not yet fully understood. 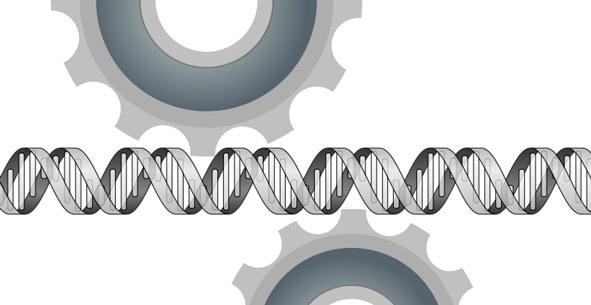 The study, called the Encyclopedia of DNA Elements, or ENCODE, raises serious questions for synthetic biologists about the limitations of the “engineering” paradigm that they are applying to living systems. While there may be encyclopedic knowledge of the mechanics of electronic components and their interactions, clearly there remain far more questions than answers about the biological mechanisms that govern living organisms. In fact, in many respects scientists know less today about these mechanisms than they did even just five years ago. As the NHGRI said at the release of the ENCODE report, scientists are now challenged “to rethink some long-held views” about genetic components and what they do. Given this scarcity of knowledge, can synthetic biologists truly claim to know enough about living, reproducing biological systems to design artificial organisms—and, more important, to reliably predict their behavior and effects once they have been released? Are the parallels they draw between electronic components and biological parts accurate, or even relevant? More specifically, synthetic biologists have left unaddressed several critical mechanisms that limit their ability to predict the long-term consequences of synthetic organisms. One is the effects of horizontal gene transfer—the natural mechanism that moves genetic material between species and even kingdoms and facilitates, for example, the transmission of avian influenza to other animals, including mammals—when artificial genes make their inexorable move across species to indigenous organisms, or vice versa. Also unaddressed are issues about mutation and evolution; that is, how synthetic organisms will adapt to their environment once they are released. Likewise, synthetic biologists do not know how effective are the methods (such as sterilization of engineered organisms) that they say they will use to prevent synthetic life forms from reproducing. In fact, a 2004 National Academies study addressing the “bioconfinement” of genetically engineered organisms stated flatly that no single method could be considered effective. Under normal circumstances, these kinds of issues might best be considered as part of a scientific research agenda, and not as topics that should fall within the purview of governance and regulatory oversight. But the circumstances surrounding synthetic biology’s development are anything but normal. Rarely, if ever, has scientific discovery been so tightly coupled with proprietary commercial development, with so little time set aside for reflection and testing, so little consideration of results in the context of broader understanding, and so little independent review of research findings in anticipation of commercial release. In fact, the technologies and products for creating synthetic components are already affordable and widely available to virtually anyone with access to the Internet, a credit card and a shipping address—or to any clever biology student, for that matter. When Eckard Wimmer, professor at the State University of New York, Stony Brook, who first synthesized the poliovirus from single nucleotides, was interviewed for a 2006 journal article on synthetic biology, he said, “With this technology you can make poliovirus for 50 cents. [I]n five years you [could] have this synthesis facility in every university lab. … You cannot stop this technology because there is a great hunger for it from many biologists.” Wimmer’s “five years” could conceivably come much sooner. For two years before the Venter Institute’s January 2008 announcement, for example, hundreds of undergraduates from around the world had spent their summer holidays making biological parts and building systems with them. In 2006 alone, 32 teams that participated in the International Genetically Engineered Machines, or iGEM, competition, hosted by the Massachusetts Institute of Technology, added 724 new biobricks to MIT’s Registry of Standard Biological Parts. In 2008, 84 teams and more than 1,000 undergraduate participants from 21 countries across Asia, Europe, Latin America, and the U.S. participated. Biotech companies and venture funds from around the world sponsor teams in the competition. The iGEM competition is only one example of the investment money and taxpayer-funded research dollars that are flooding the nascent field of synthetic biology. The potential payoff for the ability to build and sell novel living organisms is considered to be so great that venture capitalists, government agencies and multinational corporations, including BP (formerly British Petroleum), Shell, Cargill, and Dupont, are already investing in research and partnerships with startup companies to drive synthetic biology products to market as quickly as possible. Synthetic biology products may eventually comprise a significant portion of what analysts at Morgan Stanley estimate will be a trillion-dollar market for alternative fuels by 2030. Several companies, including Dupont, already produce commercial “bioplastics” that are manufactured by semi-synthetic bacteria. The synthetic biology company Solazyme recently announced that it would partner with Chevron, the world’s seventh-largest corporation, to develop biodiesel from synthetically redesigned algae. BP is an equity investor in Craig Venter’s company, Synthetic Genomics, Inc. (Financial terms for the latter two deals were not disclosed by the companies.) In addition, several U.S. government agencies, including the Departments of Defense and Energy, the National Institutes of Health, and the National Science Foundation, have already made investments of millions of dollars in synthetic biology centers and projects, and published NSF research priorities for the 2009 fiscal year indicate synthetic biology funding may increase. A handful of science-minded foundations, most notably the Bill and Melinda Gates Foundation, are investing in synthetic biology projects. Not wanting to be left behind, the European Union is funding the development of a European strategy for synthetic biology, including “stimulation activities” for the mobilization of public and private resources to fuel the nascent industry. Researchers in Africa, Canada, India, Israel, Japan, Korea, Latin America, Slovenia, Turkey, and many other countries are said to be actively pursuing synthetic biology projects as well. Synthetic biology poses what may be the most profound challenge to government oversight of technology in human history, carrying with it significant economic, legal, security and ethical implications that extend far beyond the safety and capabilities of the technologies themselves. Yet by dint of economic imperative, as well as the sheer volume of scientific and commercial activity underway around the world, it is already functionally unstoppable. With hundreds of millions of dollars worldwide already spent or committed to synthetic biology R&D across several sectors, and what is almost certainly millions more in undisclosed venture financing and corporate partnerships, companies are driving hard to deliver products for commercial release. This drive to market, coupled with no substantive expert, stakeholder or public policy discussion regarding the balance of risk and benefit for its products, has led many observers to declare that synthetic biology is a juggernaut already beyond the reach of governance. Proponents are quick to point out that synthetic biology research and its products are not entirely unregulated. In the United States, the NIH still requires laboratories receiving NIH funds to comply with laboratory procedures as outlined in their Recombinant DNA Guidelines. A drug produced by a synthetic organism would be evaluated like any other by the Food and Drug Administration. Also, depending on the application, the Environmental Protection Agency or the U.S. Department of Agriculture would oversee the potential release of synthetic organisms into the environment. This argument, however, presumes that present regulations are appropriate for evaluating the products of synthetic biology. The critical question that has not been explored is whether synthetic biology poses unique risks that are unconsidered by present health and safety regulations (and regulatory approaches), as well as by financial regulations that govern intellectual property rights and trade. Some of synthetic biology’s researchers, investors and funders acknowledge the possibility of unintended consequences, but for the most part they minimize the risk, openly acknowledging that they want to avoid synthetic biology becoming the new target for the negative perceptions that many people around the world continue to hold for biotech crops and other biotech products. As a group, they overwhelmingly insist that if synthetic biology is to fulfill its promise, scientists must be trusted to do the right thing, and that existing regulations are sufficient to shield the public from any hazards that might result from the products of synthetic biology. This perspective is best expressed by a recent statement made by Victor de Lorenzo, vice director of the National Centre of Biotechnology in Madrid, Spain. In a 2006 article in the journal of the European Molecular Biology Organization, he said, “I think the question of regulation should not be the first question. … Let’s first see what [the technology] is good for. If you first ask the question about risk, then you kill the whole field.” The main argument used in favor of self-regulation of synthetic biology’s processes is that they are simply the result of a more sophisticated application of the aforementioned laboratory techniques developed for working with recombinant DNA. As for the products of synthetic biology, practitioners argue that they already fall within the purview of existing regulations that govern genetically engineered organisms and the substances that these organisms may produce. But these characterizations sell short several fundamental, related differences between the two practices, and ignore the history of how genetically engineered organisms came to be as lightly regulated as they are today. These differences and regulatory history are worth reviewing before turning our attention to recommendations for improving the governance of synthetic biology’s products and processes. 1. Synthetic biology is based on the intentional design of artificial biological systems, rather than on an understanding of natural biology. Like traditional genetic engineering, synthetic biology uses recombinant DNA techniques to manipulate and construct various kinds of DNA molecules. The goal of a synthetic biology engineering project, like that of traditional genetic engineering, is to create an organism that does what its engineer has designed it to do. But as one report notes, “genetic engineering [is] a cut and paste affair,” shuttling traits from one naturally existing organism to another. “By contrast,” the report continues, “today’s synthetic biologists are armed with the biological equivalent of word processors.” That is, rather than simply being able to splice DNA “words” into or out of existing organisms, synthetic biologists are now in the early stages of learning to write and assemble from scratch the entire paragraphs of code needed to make an entire organism. Creating unprecedented life forms that can grow, reproduce, mutate, evolve and transfer their genes to other, naturally occurring organisms will yield consequences that are impossible to anticipate with today’s knowledge. The process is dramatically different from modifying the function of an existing organism using the techniques of traditional genetic engineering. For example, part of the early sales pitch for genetic engineering was that it is more precise and predictable than traditional cross-breeding. But in reality, genetic engineering often triggers unpredictable mutations in an organism’s genome. While most of these mutations are screened out of commercial transgenic products before they reach the market, they do occur. And when they do, they can cause unexpected and sometimes harmful changes in a living organism. (Witness the foreshortened life span and health problems that have plagued genetically engineered and cloned animals.) While synthetic biologists use the tools of traditional genetic engineering, they aim to eliminate such random events by designing, writing, or rewriting an organism’s genetic code, then synthesizing the sequence of molecules themselves, using the aforementioned “standardized” parts and DNA synthesis equipment. They say such stripped-down, intentional design, coupled with directly synthesizing the genome themselves, will eliminate much of the expensive trial and error that typifies traditional genetic engineering. They believe that they will be able to far more quickly and cheaply fabricate new or more “efficient” life forms of their own design that predictably and precisely display the desired traits. But as mentioned earlier, there remain many unanswered questions about synthetic biology that bear only a partial resemblance to those asked about traditional genetic engineering. Among them is what effects artificial life forms may have on natural organisms, and vice versa. The larger, more important point is the presupposition by synthetic biologists that their existing understanding about DNA and the processes of heredity is sufficient to enable them to safely and predictably eliminate what they believe to be “inefficiencies” in natural organisms. As evidenced by the ENCODE study, this is not specious questioning by fearful people who do not understand the science. To wit: researchers are only now beginning to discover that the so-called junk DNA that is present in all organisms (it comprises between 80 and 90 percent of the human genome, for example) serves a critical function in organisms, even though it does not contain instructions for making proteins or other cell products. What is the meaning of “efficiency” when researchers understand only a fraction of how basic biological systems function and how organisms interact with each other and their environments? What is the long-term effect of willful action in the context of so much scientific ignorance and uncertainty? Finally, the fact that synthetic biology technology can be used to design and synthesize dangerous pathogens not found in nature also challenges existing laws regarding what are known as “select agents”—the toxins and pathogens that can pose a severe threat to human, plant or animal health that are regulated by the Centers for Disease Control and Prevention. Traditional recombinant DNA technology has raised similar or related concerns, but the de novo products that synthetic biology promises will eliminate the need for those with ill intent to gain access to known, naturally occurring agents or naturally occurring genetic material from these agents. This not only greatly expands the potential availability of select agents but also circumvents the CDC regulatory framework that presently governs their possession and use. 2. Synthetic biology’s practitioners are not, as a rule, biologists or even molecular biologists. Many are computer scientists or come from disciplines that do not study or work with whole organisms, but instead apply an even more mechanistic, reductionist perspective to living systems than do traditional genetic engineers. Synthetic biology’s design and construction of simplified biological systems are, at the very least, supposed to provide scientists with a useful way to test their understanding of the complex functional networks that mediate life processes. However, this understanding is still extremely limited, and extends only to the cell and to a few very small, very simple organisms. As a rule, synthetic biologists do not concern themselves with the relationship between the genetics of organisms and their environment; that is, with how whole organisms mutate and evolve, or how disparate species exchange genetic material in nature, outside of the laboratory. Traditional genetic engineers generally hold this reductionist perspective as well, but even if they tend to ignore the long-term evolutionary or network effects of their creations, at least they have had to learn how to make alien DNA behave properly within the genomes of natural plants and animals. Synthetic biologists, having no such restrictions, can ignore even this relatively low level of complexity. But at whose peril? If the goal is a regulatory environment that intelligently anticipates the unintended consequences of a new technology, these distinctions and relationships—between molecules, cells, organisms, and ecosystems—are critical. Biologists who study organisms and ecosystems are steeped in the complexity of biological systems, and understand the limitations of their knowledge about how organisms behave and interact in the real world. The plants, animals, and microbes they study demonstrate to them on a daily basis that the cell and its molecular components are not, in fact, wholly analogous to electronic circuitry. DNA and other components of heredity do not always behave in nature in the same way as they do under the controlled laboratory conditions of synthetic, or even traditional molecular biology. Without this understanding, synthetic biologists cannot reliably predict how their inventions will behave in the natural world. 3. If the goal for synthetic biologists is both public acceptance and credible risk assessment of their products and processes, genetic engineering should not be considered a model for best practices in the context of proper governance and regulation of biological innovations. A thorough examination of the historical record shows that politics and industrial interests, at least as much as scientific evidence, drove the regulatory process for genetically engineered products from its genesis in the White House Office of Science and Technology Policy in 1986. The same is true today of synthetic biology. OSTP’s starting assumption for biotech regulation, made at the behest of industry, was that only the products of genetic engineering, and not the radical new process (recombinant DNA) that was used to create them, should be considered in a safety evaluation. This assumption was noted as scientifically questionable by several administrators and scientists inside the FDA itself at the time the first regulation for a genetically engineered organism was being developed. Among other things, they noted, the product category was brand-new, thus literally no evidence or historical data, other than that provided by industry applicants, existed upon which to base such a statement. What’s more, they said, while various experts in molecular biology, chemistry, toxicology, and related fields were asked to provide input to the FDA regarding risk, not one risk analyst was invited to do so—despite the fact that the entire purpose of risk analysis is to scientifically assess the potential effects of taking action in the presence of uncertainty. By selectively narrowing the scope of their concerns and a priori not considering the process of genetic engineering itself as part of their risk evaluations, regulators were able to speed the products of genetic engineering to market. When confronted with the historical record on biotech regulation, proponents often say that there have been no known health or environmental effects as a result of genetically engineered organisms, so the approach was the right one. However, in the United States at least, there is no objective way of knowing whether that statement is true. Existing regulations contain no requirements for monitoring the movement of genetically engineered organisms in the field once they have been approved, or for labeling products with genetically engineered ingredients in the marketplace. There is no tracking or monitoring of the potential effects that engineered organisms may be producing in other living things. As a result, both the organisms and their effects are literally untraceable, should a health or safety issue arise. Nonetheless, synthetic biologists today are arguing that existing laws and policies are sufficient for their products in the presence of even more scientific uncertainty and less historical data than are available for transgenic organisms. It is an easy argument to make, and one that is not likely to be refuted by the regulators themselves, since both U.S. law and regulatory philosophy tends to place the burden of proof regarding risk or hazard on those who oppose a new technology. If new regulations cannot be avoided, agencies often work closely with regulated industries to develop the rules and select the methods that will inform the assessment process. As a result, safety determinations about a technological innovation are almost always based on evidence that regulators know the scientists can provide—a situation that inevitably leaves unasked many of the larger, more complex questions about potential hazards that scientists cannot easily answer. Self-regulation is already running into snags in the context of intellectual property; that is, who owns and controls the discoveries upon which the nascent industry of synthetic biology is based. Many academic scientists who are at the forefront of developing the technology publicly support the development of a synthetic biology “commons”—a legal framework for public access to common resources and goods (such as water) for a given community. In the context of synthetic biology, an intellectual property commons would ensure that standard biological parts remain freely available and unfettered by patent thickets that have been known to slow or halt academic research, stifle innovation and keep the fruits of discovery out of economic reach for those who might need them most. At the same time they are encouraging the development of this bioparts “commons,” and in seemingly contradictory fashion, many of these same academics serve on the scientific advisory boards of synthetic biology companies that are working to develop the proprietary patent portfolios that are required to attract investors. This paradox spotlights another critical issue regarding the credibility and objectivity of the evidence that scientists provide regulators regarding the risks of synthetic biology’s products and processes. Most synthetic biology researchers, even more than traditional biotechnologists, operate simultaneously in several spheres: as academic researchers receiving government funding for research and product development, as inventors seeking patentable discoveries, as company founders receiving investment capital from the private sector to finance product development based on those patents, and as members of scientific advisory boards for groups that are engaged in similar activities. How these conflicts affect synthetic biologists’ attitudes and perspectives on risk, and their impact on both the quality of research and the long-term viability of the nascent synthetic biology industry, has not been addressed in proponents’ reports or studies on the topic. The wide variety of products, activities and players involved in synthetic biology research and development can be separated into some general categories (see Appendix). Hundreds of scientists, companies and organizations worldwide are associated with these categories. Not all of them are key to emerging governance issues, but it is important to keep all of them in mind, because many of these categories include product offerings, methods, and practices that are shared with traditional biotechnology research and product development (such as DNA synthesis). As a result, a very large “industry-in-waiting,” so to speak, is poised to take advantage of advancements in synthetic biology. Without regulatory acknowledgment of the differences between traditional genetic engineering and synthetic biology products, these players will not have to change their existing practices or offerings very much to “upgrade” into the synthetic biology category. This will quietly increase the sector’s activity, the potential volume of products and, subsequently, the risks it poses. It is also important to note that some categories of research and development in synthetic biology are closely related to nanotechnology, another area of scientific innovation that has proven to be challenging for proper regulatory oversight and governance. Because of the untested nature of both the risks and the benefits of synthetic biology, and the tremendous financial impetus to bring commercial products based on the technology to market, it is important to take action as quickly as possible to improve the oversight and governance of synthetic biology. Four recommendations are given below. The goal is to get to Priority 3, the comprehensive risk assessment, as quickly as possible. Priorities 1 and 2 must be done first in order to best inform that assessment, and they, too, should be done without delay. Priority 1. Research and report the current regulatory situation for synthetic biology across agencies and sectors. Because of the “déjà vu” argument being presented by proponents, this research should include a reassessment of the viability and utility of regulations for the products of traditional genetic engineering. A detailed and comprehensive assessment of the regulatory environment for synthetic biology, both in the United States and abroad, is critical in order to provide a realistic foundation for future conversations about this technology. Because synthetic biologists are likely to use the official safety record of genetically engineered organisms as an argument for no additional regulations, it is important to reassess the shortcomings of these existing policies as well. In addition to including the process as well as the products of synthetic biology, this assessment must include the current thinking about scientific uncertainties in genomics-related disciplines, starting with the ramifications of findings such as those produced by the ENCODE study. In the context of the synthetic biology “commons” and other intellectual property issues, the assessment must also consider how synthetic biology is being considered within the World Trade Organization and in the context of its Trade-Related Aspects of Intellectual Property Rights agreement (commonly referred to as TRIPS), as well as within individual countries’ thinking and activities in the area. A tremendous amount of synthetic biology activity, much of which is intended to eventually yield commercial products, is taking place around the world. It is critical to learn which way governments around the world are leaning in terms of synthetic biology regulation. If one of their scientists or companies were to announce that it was ready to ship a commercial synthetic organism in the next 12 months, what would be the policy response, if any? Also critical to this assessment will be mapping where various agencies’ responsibilities and practices create gaps, conflicts or overlaps in regulatory coverage. For example, given our assessment that there are fundamental differences between synthetic biology and genetic engineering, under what circumstances will (and/or should) existing biosecurity regulations be applied? As a starting point, it might be helpful to use the concept of “select agents” and the recent report from the National Science Advisory Board for Biosecurity on synthetic biology. Select agents are pathogens or biological toxins that have been declared by the Department of Health and Human Services or by the USDA to have the “potential to pose a severe threat to public health and safety.” Possibly the most influential agency in the context of synthetic biology regulation, NSABB represents more than a dozen U.S. government offices and agencies, including EPA and USDA, which may be charged with regulating the products of synthetic biology. In the summary of its findings, the report noted the need for additional clarity about existing regulations, because “responsible agencies, affected scientists, and commercial providers differ in their interpretation of the laws, regulation and policies” as they affect synthetic biology. Given the global ubiquity of synthetic biology research and the possibly imminent release of synthetic biology products, policymakers need to be able to gauge the effectiveness of the existing oversight system—including the consistency of coordination (or lack thereof) across agencies sharing the oversight responsibility and the realities of field practice. Furthermore, the report stated that the speed of technological advances “will require governance options that are capable of keeping pace with rapidly evolving science.” One of the questions to be addressed, the answer to which would be of broad utility, is “How can possible risks associated with the generation of novel organisms be addressed?” It might also be useful to investigate whether non-obvious policy alternatives exist that could be deployed if agencies cannot be compelled to take proper action. Priority 2. Conduct a comprehensive critique of the synthetic biology reports that have been published so far, and assess their impact on decision makers. Virtually all the reports on synthetic biology have come from the synthetic biology community or from a proponent’s or an opponent’s point of view. These reports have serious logical flaws and omissions of fact and critical perspective, and they should be countered by a more objective source as soon as possible. Of the most concern in the context of risk and governance are the reports that uncritically support synthetic biology, as they encourage development and commercial release with little or no acknowledgment of the degree of scientific uncertainty that surrounds the endeavor. 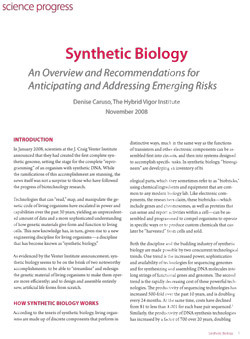 A 174-page report on synthetic biology published by Bio-Economic Research Associates in 2007 and funded by the Department of Energy (which itself has invested heavily in synthetic biology research), contained but a single, three-quarter-page discussion of the limitations of the engineering paradigm as applied to living systems. Giving such short shrift to a topic that is still under deep consideration in the broader scientific community lends an air of certainty to a highly uncertain endeavor. Such under-representation has real significance from the perspective of investment and economic risk, as well as from that of health and the environment. Similarly, and perhaps most disappointingly, a $500,000 report funded by the Alfred P. Sloan Foundation on synthetic biology’s “Options for Governance” was co-authored by two of the pioneering institutions of synthetic biology, the J. Craig Venter Institute and MIT, along with the Center for Strategic and International Studies. Promoted as a “stakeholder” study on the broader societal risks and implications of synthetic biology, the Sloan study instead focused mainly on the largely benign laboratory procedures for handling synthetic organisms in the context of biosafety. It did not substantively address the more significant issues of scientific uncertainties, intellectual property conflicts, or the social implications and the intended and unintended effects of synthetic biology’s products on human health or the natural environment. Not surprisingly, given its co-authors, the “options for governance” that were presented in the study’s conclusions weighed heavily in favor of self-regulation. Discovering the degree to which such biased perspectives and recommendations have affected decision makers will be an important step in a more relevant and comprehensive approach to assessing synthetic biology’s risks. This knowledge will also be an important factor in deciding how quickly action must be taken to counter their biases, as legal judgments or official decisions on synthetic biology become imminent. Priority 3. Using (and challenging the assumptions of) the data and scenarios in the above-mentioned reports, conduct a comprehensive risk characterization of synthetic biology. Given the financial and intellectual momentum of the nascent industry, it is not surprising that there is a tremendous aversion in the synthetic biology community to speaking directly about the risks of unintended or unanticipated consequences, or to involving risk practitioners who are schooled in methods that are designed for highly uncertain issues or experts from other sectors in assessments of its future. It is very difficult to find a synthetic biology report that uses the word risk more than in passing, let alone directly addresses the subject at any depth. One reason for this omission is that many scientists believe the word risk refers to a technical calculation of probability that is demonstrable only by way of “evidence” that a risk exists. Such calculations are near impossible, however, when analyzing technological innovations, where there are no historical precedents other than by analogy and sparse data to use in a probability calculation. Yet without data, these scientists say, there is no risk, only speculation. While technically “scientific” in its approach, this circular argument forces decision makers to consider only a very narrow, pre-determined and ultimately subjective view of the important issues they are being asked to address. However, there is another approach to risk assessment that has proven very useful for decisions regarding scientific and technological innovations. This approach combines data analysis and extensive deliberation with a broader representation of relevant scientific expertise, as well as parties who are interested in the issue or who will be affected by the outcome of the analysis. This process of analysis and deliberation is described in the 1996 National Academy of Sciences study, Understanding Risk: Informing Decisions in a Democratic Society. Should this type of assessment be undertaken, the analytic deliberative approach could be augmented with a methodology that is under development by myself and Baruch Fischhoff at Carnegie Mellon University, designed to address unprecedented risks such as those presented by synthetic biology. It uses scenario narratives to develop comprehensive risk models that are computable over time, as research continues and data become available. There are several credible scenarios available regarding synthetic biology that, taken together, could provide the foundation for characterizing and assessing synthetic biology’s risks and benefits. Such an assessment would be designed to yield five important outcomes: (a) A mutually agreed-upon risk/benefit model for lawmakers to use in regulatory decisions. This model would map critical scientific uncertainties associated with commercialization and/or release of synthetic organisms (e.g., the effects of evolution, environmental and health effects, assessment of product versus process, the significance of horizontal gene transfer, synergies between synthetic biology and nanotech), as well as economic, legal, biosecurity, social and ethical implications for the United States and its relationship to other countries; (b) An understanding of the degree to which existing biotech regulations can usefully be applied to synthetic biology processes and products and, conversely, where they should not be used; (c) A scientific research agenda for addressing knowledge gaps and known risks as revealed by the assessment process; (d) A contingency/preparedness plan for unintended consequences, including potential legal strategies should rational approaches not prevail; and (e) A public database/repository to collect information on synthetic biology so that risks (and regulations) can be reassessed as new data are added and uncertainties are reduced. Priority 4. Convene cross-sector stakeholder working groups on elements in the assessment that were deemed most important to address. After the risk characterization has been completed, stakeholder groups should develop policy recommendations for addressing the issues and elements of concern. At this point, these groups would likely be organized around at least the following three elements: (a) Scientific uncertainties. How should the nature and extent of the scientific uncertainties in synthetic biology, discovered during the risk-characterization process, affect regulatory policies? Are there examples of more iterative (Bayesian) approaches to policy that can be deployed for issues such as these, where well-informed decision makers have determined there is a need to move forward with research and development despite scientific uncertainty? What is required in terms of research funding to better address these uncertainties in advance of commercial deployment? (b) Patents and intellectual property. How do existing patent and intellectual property laws add to or lessen the broad risk profile for synthetic biology products? What would happen if a significant portion of the field’s intellectual property remained in the public domain or commons, as some synthetic biologists want? What would be the social and economic implications of various patent approaches to synthetic parts and organisms? Having this conversation soon, before too many synthetic biology patents are issued, could be tremendously useful. (c) Human factors. What human factors affect the regulatory/policy profile for synthetic biology’s products and processes, and what kinds of interventions can best address them? Who are the equivalents of the nuclear plant operators in synthetic biology scenarios, i.e., what constitutes risky behavior for humans using synthetic biology in the field? This group would look at implications for deliberate misuse of the technology as well as for bioerror. If even a fraction of its proposed applications pan out over the long term, synthetic biology has the capacity to radically change our approach to some of the most pernicious problems of our time. That human beings may someday know enough to safely and predictably engineer life forms that can eliminate ocean pollution, generate sustainable energy sources, or help to eliminate infectious diseases will be nothing short of transformative. So it is no wonder, standing at what seems to be the very brink of such tremendous promise, that proponents of synthetic biology want to dismiss most conversations about risk as speculation. But it is important to note that in its early stages, the promised benefits of any technological innovation are purely speculative as well. While there may not be historical precedent for synthetic biology, the history of science is replete with examples of the high price of biological interventions that were brought to market or released without sufficient consideration of consequences. For example, the toads that were imported from Hawaii to rid Australia’s sugarcane plantations of beetles have instead eaten all the native amphibian and invertebrate species in their path—except the cane beetle. The morning-sickness drug DES, sold to millions of women between 1940 and 1971, was almost entirely ineffectual for its ostensible purpose, yet has passed along its carcinogenic mutations to children in every subsequent generation. The overuse of man-made antibiotics has created new strains of “superbugs” that are virtually unkillable and can make being admitted to a hospital more life-threatening than staying at home. And we have not yet begun to tally the costs of regulatory myopia about nanotechnology, where agencies remain loathe to step in despite the demonstrated health and environmental risks of some nanomaterials. Synthetic biology stands to have a far greater impact than all of these—especially if its products are allowed to be released without pausing for thoughtful consideration of risk and benefit in the context of scientific uncertainty. Many of synthetic biology’s proponents see such consideration as an opportunity cost, maintaining that both money and benefit are lost each day their activities are questioned or delayed. But the role of government is to understand these developments in a broader context, properly oversee them, and ensure that society is not forced to bear the cost of that opportunity, should plans go awry. Today, with the benefit of hindsight, we have developed the methods to practice foresight in these matters. We have in hand the means to practically address scientific uncertainty and risk for the benefit of all stakeholders: the industry, the independent research community, and the public. The sooner and more willingly that we as a society embrace those means, the greater the opportunity will be for synthetic biology to fulfill its promise. I am grateful to David Rejeski at the Woodrow Wilson International Center for Scholars for supporting the research and the writing of this report; and to the Center for American Progress and Rick Weiss for its final production and publication. All views expressed herein are my own, and do not necessarily reflect the positions of either organization. Denise Caruso is executive director and co-founder of the Hybrid Vigor Institute, an independent, not-for-profit research organization and consultancy that is dedicated to interdisciplinary and collaborative problem solving. She is the author of Intervention: Confronting the Real Risks of Genetic Engineering and Life on a Biotech Planet, which won a Silver Medal in the Science Category of the 2007 Independent Publisher Book Awards, and was listed as a “Best Business Book of 2007” by strategy+business magazine. She also edits and contributes to the Institute’s blog, at hybridvigor.org and, in 2008, was named a contributing editor for strategy+business, where she writes about risk, public policy, and innovation. Caruso has developed and served as co-principal investigator on research projects that aim to improve upon traditional methods of risk and decision analysis for innovations in science and technology. Topics of case studies in which she has been involved, funded by the National Science Foundation, have included the risks of xenotransplantation using genetically modified pigs, and the risks of pandemic avian influenza. She is an affiliated researcher at the Center for Risk Perception and Communication at Carnegie Mellon University. Since 2003, she has been a member of Global Business Network, a worldwide organization that works to enhance competitive and adaptive capacities in organizations through collaboration, scenario development, and strategic planning. Caruso is also a veteran journalist and analyst. In 2007, she wrote “Re:framing,” a column on innovation and creativity, for the Bright Ideas page in the Sunday Business section of The New York Times. She also chronicled the converging industries of digital technology and interactive media from the mid-1980s to 2000. For the five years prior to founding Hybrid Vigor in 2000, she wrote the Technology column for the Monday Information Industries section of The New York Times. One of the first journalists to focus on the intersection of technology, commerce, and culture, Caruso is a director emerita of the Electronic Frontier Foundation. She was elected to the board of directors of the Independent Media Institute in January 1995, and continues to serve in that capacity. She is a trustee of the Molecular Sciences Institute, a non-profit laboratory conducting research into basic biological processes. She also serves on the advisory boards of several organizations, including Public Knowledge and London-based SustainAbility.com; she recently became an advisor to Echo & Shadow, an intelligent robot company. Hundreds of scientists, companies, and organizations are already engaged in synthetic biology research and development. A comprehensive, albeit somewhat dated list, with an emphasis on research and researchers in North America and Europe, may be found in the European Union report “Synbiology: An Analysis of Synthetic Biology Research in Europe and North America,” published in October 2005. The general categories of key products, applications and players in the field of synthetic biology (listed alphabetically) are populated as follows. Within these categories, the activities of a handful of key players are being closely watched. These are some of the best known: 1. George Church: professor of genetics, Harvard Medical School; director, Center for Computational Genetics, Harvard University; co-founder, Codon Devices; co-founder, LS9 Inc. Considered one of the pre-eminent synthetic biology researchers, Church is also a well-known figure in the larger biology community. His 1984 Ph.D. dissertation included a description of the first direct genomic sequencing. He also co-initiated the Human Genome Project while serving as a postdoctoral fellow at Biogen and as a Monsanto fellow at the University of California, San Francisco. As director of the Center for Computational Genetics, he is developing broadly distributed, integrated models for biomedical, biofuel, and ecological systems. The Center’s research currently focuses on genome engineering and synthetic biology development to build “genetic circuits,” vaccines and optimal drug biosyntheses. Among many other active and advisory affiliations, Church also co-founded Codon Devices in Cambridge, the first venture-backed synthetic biology company that is focused on synthesizing very long pieces of custom DNA, and LS9, which is designing biofuels produced by microbes created via industrial synthetic biology. 2. Drew Endy: assistant professor in the Department of Bioengineering at Stanford University The former assistant professor at the Massachusetts Institute of Technology moved to Stanford University in fall 2008 to become its first synthetic biology professor and is probably the best-known and most public face of synthetic biology. Widely acknowledged as a founder of the field, he is one of its most active participants in all aspects, from academic research to social implications and commercial development. At MIT, he co-founded the Registry of Standard Biological Parts as well as the annual iGEM international synthetic biology design competition, where teams of undergraduate students create novel biological parts and build them into working systems. He is a co-founder of Codon Devices. He also started the non-profit BioBricks Foundation, whose mission is to ensure that standard biological parts remain freely available to the public and to encourage the development of codes of standard practice for the use of standard biological parts. 3. Foundations a. The Bill & Melinda Gates Foundation The Gates Foundation is helping drive synthetic biology research out of the lab and into applications by investing in health-related synthetic biology products. In addition to the $42.6 million it granted to three organizations for the development of a synthetic microbe to produce an anti-malarial compound, the Foundation has granted $19.4 million to a consortium, led by the Seattle Biomedical Research Institute’s Viral Vaccines Program, to create synthetic molecules to trigger antibodies against HIV. b. The Alfred P. Sloan Foundation The Sloan Foundation is one of the few remaining private philanthropies that funds direct research in selected areas of scientific significance. In 2005, Sloan’s Bioterrorism Program awarded $500,000 to the J. Craig Venter Institute, in collaboration with the Center for Security and International Studies and the Synthetic Biology Group at MIT, to examine the risks and benefits of synthetic genomics in the context of regulations and governance. Through its Bioterrorism Program, Sloan has also made several other grants aimed at addressing issues of potentially dangerous applications of synthetic biology. These include a feasibility study to develop a global network of bioscientists, support for a workshop on Genomics for Development, Bioterrorism, and Human Security, and an assessment of the World Health Organization’s oversight of smallpox virus research. 4. Jay Keasling: director, SynBERC, University of California, Berkeley; co-founder, Amyris Biotechnologies Keasling is responsible for two of the field’s largest and most visible synthetic biology projects, spanning both academic research and commercial development. He is director of the Synthetic Biology Engineering and Research Center (SynBERC) at U.C. Berkeley, funded with $16 million from the National Science Foundation and $4 million from the biotech industry and participating universities. Amyris, which he co-founded, is developing synthetic microbes capable of producing novel pharmaceuticals, renewable fuels and specialty chemicals. SynBERC and Amyris, along with OneWorld Health, were Gates Foundation grantees for the development of synthetic microbes to produce artemisinin, an anti-malarial compound. 5. U.S. Government The U.S. government is a primary driver of the nascent industry of synthetic biology. Several agencies have each committed several millions in taxpayer dollars to synthetic biology researchers and organizations, most of which is directed toward specific applications. These include the NIH, including the National Cancer Institute, the National Institute for Allergy and Infectious Diseases, the National Institute of General and Medical Sciences, the National Institute of Biomedical Imaging and Bioengineering, the NIH Roadmap Program, the Nanomedicine Program, and the NIH Cancer Biology Training Grants Program. The Department of Energy is funding research and development into synthetic organisms to produce biofuels and clean up pollution, as well as explorations into societal consequences such as the relationship of synthetic biology to intellectual property law. The Department of Commerce’s Advanced Technology Program has awarded a grant for the development of synthetic microbes to convert sugars into plastic. The NSF also has committed several millions of dollars to synthetic biology research, primarily to academic institutions. 6. J. Craig Venter: founder, Synthetic Genomics, Inc., and the J. Craig Venter Institute Venter is still best known for his role in mapping the human genome, but his personal ambition, combined with his ability to draw worldwide media attention, has placed his organizations’ activities at the center of the synthetic biology field. He and Drew Endy are generally the scientists of record when questions about the risks of synthetic biology are raised by outsiders. Venter’s activities are also the most visible example of the fluid financial arrangements that typify synthetic biology. His privately held company, Synthetic Genomics, is developing synthetic genomes and organisms for commercial applications in renewable energy and bioremediation—based on research done under the auspices of his own non-profit research institute, the J. Craig Venter Institute. The institute, which is funded by government grants as well as by Synthetic Genomics, is focused on trying to develop a minimal cell in order to build a new cell and organism with optimized functions. Synthetic Genomics’ president is Aristides Patrinos, former director of the Office of Biological and Environmental Research for the DOE, which made significant investments in synthetic biology and, more specifically, in Venter’s projects during the period when Patrinos was at the helm. 7. Venture Capital Firms Venture capital may be more responsible for driving the creation of a synthetic biology industry than are the scientific discoveries coming from the research community. At the time Codon Devices received its first round of venture capital, for example, its co-founders and principals (named above) were basically the entire roster of synthetic biology researchers in the world. A handful of well-known venture capital firms, primarily those that have been involved in early-stage science and technology investments in Silicon Valley and in Cambridge-based startup companies, have already established a beachhead in the synthetic biology area. These firms include Alloy Ventures, Khosla Ventures, Kleiner Perkins Caufield & Byers, Mohr Davidow, and X/Seed Capital. A base pair refers to the two nucleotides that form a “rung” of the DNA ladder. The number of base pairs is used to describe the length of a DNA strand. DNA sequencing is the process of determining the exact order of the base pairs that comprise individual genes as well as whole genomes. DNA synthesis is a natural cellular process that replicates DNA, but as used here refers to artificial, chemical replication. James Newcomb, Robert Carlson, Steven Aldrich, Genome Synthesis and Design Futures: Implications for the U.S. Economy (Cambridge, MA: Bio Economic Research Associates, 2007). The ENCODE (ENCyclOpedia of DNA Elements) Project, available at http://www.genome.gov/10005107 (accessed August 18, 2008). Committee on Biological Confinement of Genetically Engineered Organisms, “Biological Confinement of Genetically Engineered Organisms” (National Research Council, 2004). Holger Breithaupt, “The engineer’s approach to biology,” EMBO Reports, 7(1)(2007): 21-24, available at http://www.pubmedcentral.nih.gov/articlerender.fcgi?artid=1369239 (accessed August 8, 2008). Elizabeth Pain, “Getting Ready for Synthetic Biology,” Science Careers, October 17, 2008, 10.1126/science.caredit.a0800152, accessed at http://sciencecareers.sciencemag.org/career_magazine/previous_issues/articles/2008_10_17/caredit.a0800152. Arti Rai and James Boyle, “Synthetic Biology: Caught Between Property Rights, the Public Domain, and the Commons,” PLoS Biology, March 13, 2007, available at: http://biology.plosjournals.org/perlserv/?request=get-document&doi=10.1371%2Fjournal.pbio.0050058&ct=1 (accessed August 8, 2008). Breithaupt, “The engineer’s approach to biology.”  The ETC Group, “Extreme Genetic Engineering: An Introduction to Synthetic Biology” (Ontario, Canada, 2007), available at: http://www.etcgroup.org/en/materials/publications.html?pub_id=602 (accessed August 18, 2008). National Science Advisory Board for Biosecurity, “Addressing Biosecurity Concerns Related to the Synthesis of Select Agents” (Rockville, MD: National Institutes of Health, 2006). A lengthy discussion of this issue can be found in Intervention: Confronting the Real Risks of Genetic Engineering and Life on a Biotech Planet, Chapter 6, “Politics, Science and Substantial Equivalence” (Hybrid Vigor Press, San Francisco, 2006). European Commission, “Synbiology: An Analysis of Synthetic Biology Research in Europe and North America: Output D3: Literature and Statistical Review,” European Commission FP6 Reference: 15357 (2005), pp 28-40, available at: http://www2.spi.pt/synbiology/documents/SYNBIOLOGY_Literature_And_Statistical_Review.pdf (accessed August 18, 2008). National Science Advisory Board for Biosecurity, “Addressing Biosecurity Concerns Related To The Synthesis Of Select Agents.”  Michelle S. Garfinkel, Drew Endy, Gerald L. Epstein, Robert M. Friedman, “Synthetic Genomics: Options for Governance,” (Rockville, MD, Washington, DC, Cambridge, MA: J. Craig Venter Institute, Center for Strategic and International Studies, Massachusetts Institute of Technology, 2007), available at: Available at http://www.jcvi.org/cms/fileadmin/site/research/projects/synthetic-genomics-report/synthetic-genomics-report.pdf (accessed August 18, 2008). Paul C. Stern, Harvey V. Fineberg eds., Understanding Risk: Informing Decisions in a Democratic Society (Washington, DC: Committee on Risk Characterization, National Academy of Sciences: National Academy Press, 1996). Denise Caruso and Baruch Fischhoff, principal investigators, “Understanding Genomic Risks: An Integrated Scenario and Analytic Approach” (Washington, DC: National Science Foundation Award No. SES-0350493, 2006). European Commission, “Synbiology: An Analysis of Synthetic Biology Research in Europe and North America.”  Seattle Biomedical Research Institute, press release: “Sbri Receives $19.4 Million HIV/AIDS Research Grant From Gates Foundation” (Seattle, WA: 2006), available at: http://www.sbri.org/news/2006/releases_06/SBRI-Receives-$19.4M-Gates-Grant-for-HIV-Vaccine-Research.pdf (accessed August 18, 2008).